If you’re IHOP, National Pancake Day is kind of a big deal. 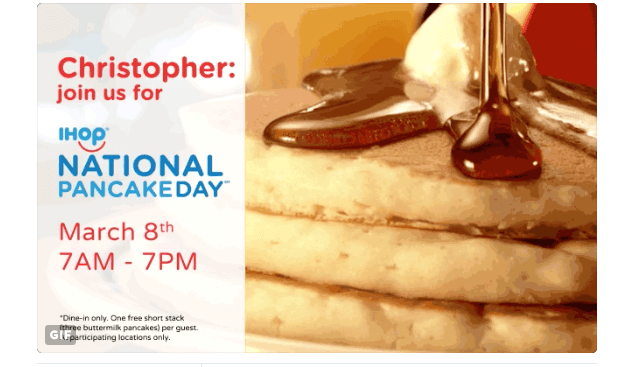 Since 2006, the company has celebrated its namesake holiday by offering consumers a free stack of pancakes for an optional donation to charities in the communities in which IHOP operates. With $20 million raised since 2006 and a 2016 goal of $3.5 million for the Children’s Miracle Network Hospitals and other local charities, IHOP upped the social media ante this year by inviting 7.3 million of their closest Twitter friends—by name. 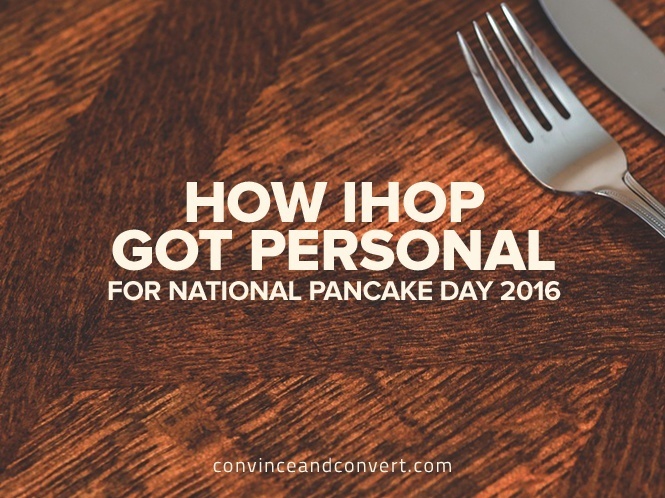 In addition to personalized ads, IHOP rose awareness for National Pancake Day on March 8th with its signature mix of GIFs, memes, and other comical tweets targeted at the company’s millennial audience.
? : you down for NPD? So, what can you learn from this campaign? As someone who was served up one of IHOP’s personalized ads (but forgot to screenshot it, d’oh! ), I’ve seen first-hand how eye-catching they are in a cluttered Twitter stream. There’s just something about seeing your first name in a tweet that pulls you in to read more. Add in a delicious image of syrup pouring over a stack of pancakes, and it’s not a hard sell—especially when the pancakes come free for a charitable donation. As discussed in my book, The Power of Visual Storytelling, stories and campaigns come to life through a dynamic mix of visuals. Mixing up types of content and different media—from photos to videos, infographics, and more—keeps your visual storytelling fresh. Take a cue from IHOP here by using different kinds of visuals, whether GIFs, funny memes, or even emoji. In a time where the customer experience is a top priority for companies, corporate social responsibility (CSR) is a hugely important component that should not be taken for granted. Not only do consumers want best-in-class products and customer service, but they also want to support businesses that genuinely share their values. Genuine is the key word here—it needs to feel authentic versus done for the sake of marketing or revenue gain. Whether it’s a charitable initiative like IHOP’s or shaping your CSR values, goals, and programs into a story, using social media to raise awareness or power these initiatives can greatly benefit your customer’s perception of your company.